The popular Hip-hop queen Nicki Minaj is coming to in South African in less than one week form today and there is an entry ticket for it. 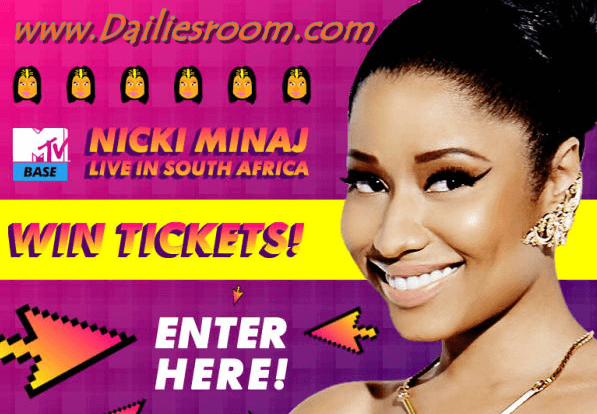 And MTV Base is giving you the chance to win tickets to see Nicki Minaj LIVE in South Africa! All you have to do is keep an eye out for the Nicki Minaj related questions on MTV Base (DStv 322) every day between 10:00 and 11:00 CAT, 14:00 -15:00 CAT and 23:00 – 24:00 CAT from Monday 14 March and come back to this page to answer the daily competition question. It’s that easy! Please note that this competition open to SA residents over the age of 18 only. Transport to and from the venue will NOT be supplied. The programming you will also be experiencing includes ; Nicki Minaj top 10, Baselines specials, Nicki Minaj: Pink Movie and so much more!